Have you ever noticed lights out on campus or uneven pavement in need of repair? Well, it’s good to know that our campus is taking steps to address these concerns! 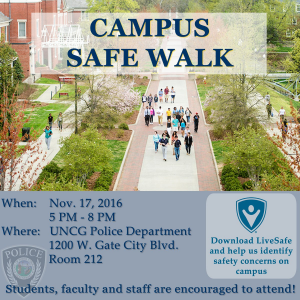 Every year the University Police Department and Student Government Association (SGA) host a Campus Safety Walk with students, officers, and staff to locate safety concerns and take corrective action. Please join us in the Fall for our next Safety Walk.